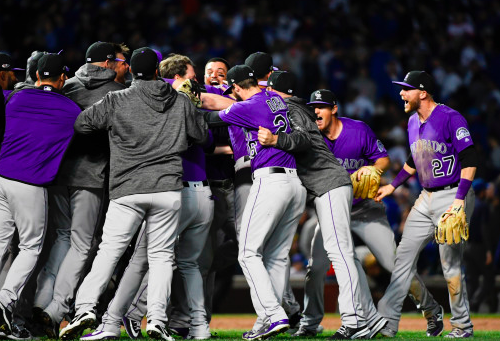 After losing in the Wild Card game in 2017, the Colorado Rockies took a step forward in 2018 by winning the Wild Card game, only to get swept in the NLDS. The Rockies now hope they can take a few more steps forward in 2019 and become legitimate World Series contenders. However, Colorado was largely quiet this offseason, so it remains to be seen if they’ve improved over the winter. Are the Rockies ready to challenge for a championship in 2019 or has this group of players reached their peak? Colorado’s rotation was below average last season, although those numbers are a little skewed by Coors Field. More importantly, Colorado’s rotation will look remarkably similar in 2019. The Rockies had four starters who all made at least 31 starts in 2018, and all four will be back with the team. Kyle Freeland was the star of the group, going 17-7 with a 2.85 ERA. German Marquez was also impressive, posting a 3.77 ERA. However, the Rockies need a bounce-back effort from Jon Gray, who had a breakout season in 2017 but fell back to earth with a 5.12 ERA last season. On the bright side, Tyler Anderson showed great consistency with his 4.55 ERA, which is solid for a pitcher making most of his starts at Coors Field. In addition to that quartet, the Rockies have a fair amount of rotation depth. Antonio Senzatela is someone to watch closely after the 24-year-old had an excellent second half in 2018. Jeff Hoffman is another young pitcher with a high ceiling despite being unable to solidify a big league spot in recent years. Chad Bettis also gives Colorado a serviceable starter at the back-end of their rotation just in case their starters don’t enjoy the same good health as last season. The numbers in Colorado’s bullpen were less than impressive last season. However, the Rockies have the personnel to put together a solid bullpen. For starters, Wade Davis returns as the team’s closer. He saved 43 games in 49 chances last year despite a modest 4.13 ERA. Scott Oberg and Seunghwan Oh both return in setup roles after each posted an ERA under 3.00 in 2018. If those two can continue to be reliable, the Rockies should limit the number of late-inning leads they give away. The two big keys for the Colorado bullpen are lefties Mike Dunn and Jake McGee. Dunn had a disastrous, injury-plagued season in 2018 while McGee posted a 6.49 ERA, nearly twice his career mark of 3.57. The Rockies desperately need both to bounce back in order to give their bullpen depth, especially with Adam Ottavino signing elsewhere. Colorado will also hope that Bryan Shaw and Chris Rusin can both put a rough 2018 campaign behind them and pitch better in 2019. Obviously, there are a lot of “ifs,” but if everything comes together, the Rockies should have a solid bullpen. Scoring runs isn’t usually a problem for the Rockies, and this year should be no different. Nolan Arenado signed an extension this winter and will continue to anchor the Colorado lineup for a long time. Trevor Story will be his primary running mate once again after the shortstop blasted 37 home runs last year. Those two will be joined by Charlie Blackmon, who serves as both run producer and table setter at the top of the order. One key to the season could be one of Colorado’s only offseason signings, Daniel Murphy. The 33-year-old missed the first chunk of last season due to injury, but he came on strong late in the season after being traded to the Cubs and should be able to provide some protection for Arenado and Story. The Rockies also have the likes of Ian Desmond, David Dahl, and Ryan McMahon providing lineup depth. All three are capable of providing power, especially at Coors Field. However, Desmond’s average has plummeted in his two seasons in Colorado while McMahon is yet to establish himself in the big leagues. Those three could go a long way toward determining how potent the Colorado lineup is this season. The Rockies definitely have the roster of a team that’ll be in the playoff race in September. After all, they’re going to be able to score plenty of runs and out-score teams regardless of whether they’re playing home or away. However, they still need their rotation to stay healthy two years in a row and they need their bullpen to come together and show some consistency. If both of those things happen, Colorado will be a legitimate contender. But it’s more likely that the Rockies will slip a little, finishing 88-74 and hoping that’s enough to get them back to the Wild Card Game.